The most common battle clasp is............."Johannesburg"! The other two clasps on the medal being sold are "Paardeberg" and "Relief of Kimberley" - both scarcer than "Johannesburg", but to which the recipient is not entitled. The counts for "Cape Colony", "Orange Free State" and "Transvaal" do not include all the men from the cavalry attached to Remount Depots. Not all these men are included in the main roll for their regiments, you could a few hundred for each of these clasps. From the table overall I excluded a handful of men - usually officers, attached to the cavalry or Staff from British volunteer cavalry units such as the Queen's Own Worcestershire Yeomanry and The Loyal Suffolk Hussars. A Bogus Claim for the Elandslaagte Clasp? Elandslaagte is one the scarcest clasps for the second pitched battle of the war that took place on October 21st, 1899. Langley's combination is interesting, Elandslaagte is most often combined with Defence of Ladysmith or Relief of Ladysmith and not just with Laing's Nek. Langley is not listed in Biggins' Elandslaagte roll (Token Publishing 2004). Is this a "new" Elandslaagte clasp? Looking for validation Langley is on the roll for the 86th Battery Royal Field Artillery - a unit not present at Elandslaagte. His clasps on this roll are Cape Colony, Transvaal and Laing's Nek, clasps consistent for this battery. Fortunately service papers exist (WO364 WW1 Series) - but not complete, unfortunately his clasp entitlement is not mentioned nor the dates he served in South Africa. However, his papers reveal much that may indicate why the Elandslaagte clasp appears on the Riding Establishment roll. Henry enlisted in The Buffs (East Kent Rgt) in 1891 as Henry Huggins. In 1894 he transferred to the Royal Artillery, possibly in India. 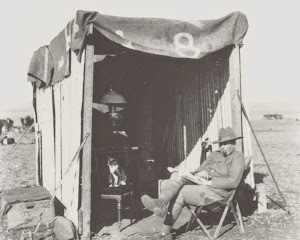 In 1898 he was transferred to the 86th Battery and then in August 1900 moved to the Riding Establishment after being invalided from South Africa. Henry's conduct was consistently bad, his offences included; "absent from 6:30 a.m. roll call", "improperly dressed in Wellington Street", insubordination, "being in bed after reveille", "found asleep on his post" and others. The Riding Establishment did not serve in South Africa, and the roll was prepared to enable those veterans to claim their medals. Langley may well have told the clerk preparing the roll he was entitled to the Elandslaagte clasp. What clasps was Langley issued with: The roll for the 86th Battery states his medal was issued from the Riding Establishment roll, with the Elandslaagte clasp? All content copyright Meurig Jones, unless otherwise indicated.. Simple theme. Powered by Blogger.